At Artfuel, we afford our clients the opportunity to be tattooed by various artists that travel from all over the country. Currently we have 5 full time artists and 1-2 guest artists at any given time. As we have new artists visit, this page will reflect their work and you can book an appointment with them by clicking on the tab at the top of the page and selecting your artist. 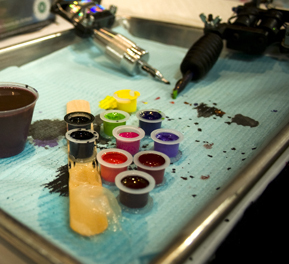 We will announce Guest Artists on our Facebook page, so stay tuned to find out who will be tattooing with us. Remember that availability may be limited, but we have a full staff to accommodate whatever you’re looking to get done!